It protects Li-Ion batteries: LiPoly and LiFePO4. It has a built-in active brake and it protects contacts against damage. The Smart Trigger function enables achieving faster trigger response. Thanks to two operating modes, the system works with both the original and the modified blaster installation. The system is designed for all replicas and especially for the upgraded ones. It has been adapted to work even with the most powerful springs, 1.5. Do you care about realism? Would you like to increase the life of the gearbox? Does your rifle have such a high rate of fire that you are not able to make a single shot? The Active Brake sorts things out. In SEMI Mode, the brake does not allow for compressing a piston after a shot. The piston will stop in the front position which eliminates unnecessary stresses, increasing the service life of the gearbox and its parts. This is important, especially with a blaster power upgrade. After releasing the trigger, the blaster immediately stops firing. So, you gain more realism and, additionally, you do not waste your precious ammunition. We know how important reliability is on the battlefield. That’s why the unit has thermal protection. In tandem with a time-lag fuse, it fully protects your blaster installation. This provides full compatibility with the micro-switches. It is fully resistant to contact bounce. 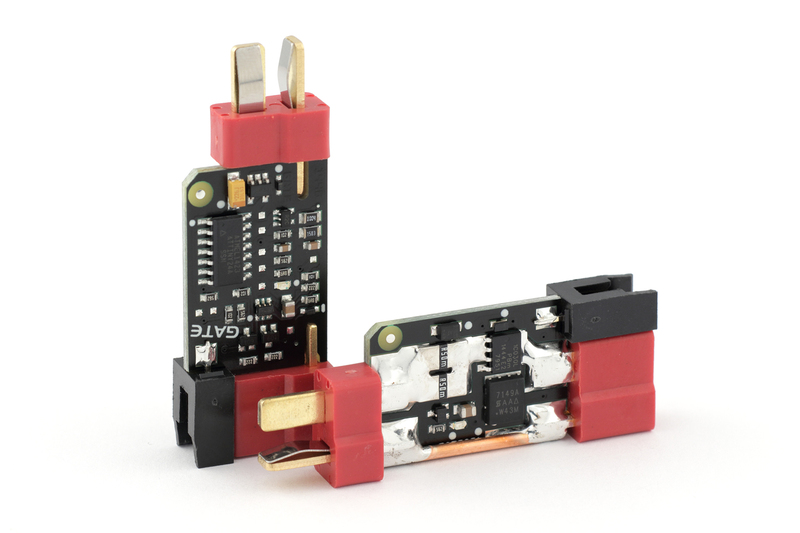 You gain a bigger ROF, a faster trigger response and your MOSFET is less prone to heating. The advent of modern transistors and microcontroller has enabled us to create the smallest and most reliable blaster Controller on the market. Plug&Play: All you need to do is connect the system between the battery and the rifle. MERF 3.2. We can do it using the signal wire attached to the kit.